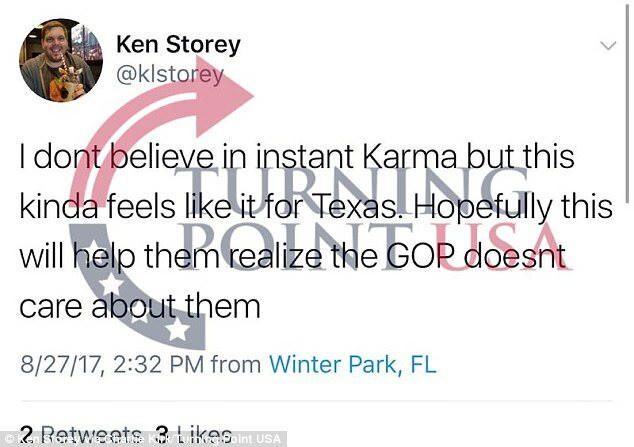 Kenneth Storey, another crazed liberal professor has joined the ranks of the unemployed after he made an asinine statement about how Texas deserved getting hit by Harvey because they voted for Donald Trump. The question I have is does he deserve his his mental retardation for voting for Hillary Clinton or did his mental retardation cause him to vote for Hillary. It’s the age old question of what came first the retardation or the vote? Personally, I think it’s too close to call because in reality, both are perfectly feasible explanations. Storey was a visiting assistant professor of sociology. Sociology is the study of structure, and functioning of human society. What I want to know is since this jerk is a liberal, what could he possibly know about being human? Let’s face it, the only reason liberals believes in evolution is that it gives them hope that in 40 or 50 million years, their descendants could be human. I have my doubts. At this point let me point out that the president was providing aid to both Texas and Louisiana before the storm even hit. Louisiana’s governor is a democrat who claims President Trump went above and beyond the call of duty in providing aid to his state, a sentiment seconded by Texas governor Greg Abbott. Now, flashback to 2011. Texas was hit by wildfires that burned 2.6 million acres. How did Obama respond? He denied the request to make it a disaster area, eligible for federal emergency funds. But in 2009 in Oklahoma that had a democratic governor, Obama approved emergency funds for a wildfire that burned 100,000 acres in 3 days. In Texas the fires lasted for 2 weeks and consumed 2.6 million acres. Notice the difference? Obama finally did approve disaster funds but not until two months after the fire. This is what Storey considers caring? Imagine losing everything and then having to wait two months for help. Obama was the disaster. A spokesman for the University of Tampa made the announcement of the firing and explained that the university fired Storey after receiving a deluge of complaints about his comments. Storey later tried to alibi his way out of it by saying that he meant that republicans caused the disaster because they do not recognize man made climate change. Liberals made the same argument after Katrina and said that there would be more frequent disastrous hurricanes and in much larger numbers because of global warming. That was the last large hurricane to hit the United States and the twelve years is a record length of time without a hurricane since records have been kept.